The mobile stage is a convenient truck-mounted unit making it easily transportable for short or long term events, road shows, concerts and more! Amongst other features, the stage can come equipped with its own lighting and high quality audio equipment, which delivers fantastic quality sound. We can even offer heating to keep the chill off in winter! Please feel free to have a chat with our team if you wish to incorporate your own specialist equipment. 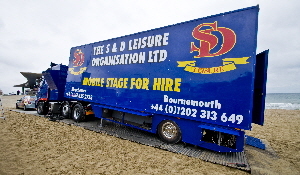 The stage is mounted and delivered on an articulated truck. Our team will deliver, construct, supervise, dismantle and remove the stage. We can even supply our own power. Interested in hiring the stage for your event? 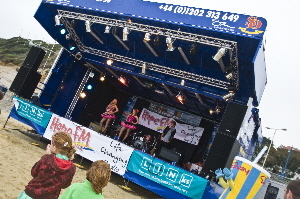 To enquire into the hire of our Mobile Stage, please contact on 0161 835 2758 or e-mail enquiries@sdleisure.com.